There was a time when due to brilliant performance of Pakistani players in different fields of sports in the world Pakistani flag was always flying high. Either these were Olympics, Asian or common wealth games Pakistani players participated for winning. In the international events of squash players of other countries participated with a hope that they will get 2nd or 3rd position because they were sure that first position will be taken by Pakistan. Same condition was of hockey and cricket has become national sports. Without Pakistani batsmen and fast bowlers cricket grounds were uninteresting. But when economical deterioration started Pakistan was thrown out of sports grounds gradually, the remaining has been done by terrorists attacks guest players and gamblers. Now the condition is that gold medal is much far, taking 3rd position for bronze medal has become difficult. In such circumstances if any of our player or athlete succeeds in securing 2nd or 3rd position a wave of happiness and hope is felt within whole nation. The people worried by daily financial and peace problems feel light and hope, otherwise everyone recalls those golden days like a dream when during a year our players returned back with uncountable medals of victory. 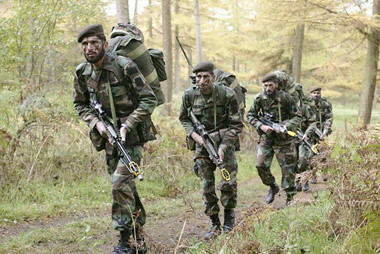 In such circumstances Pakistan army's gold medal in the most difficult international war games to examine the capabilities, coordinated command system, physical fitness and professionalism is not less then a great victory for Pakistan. 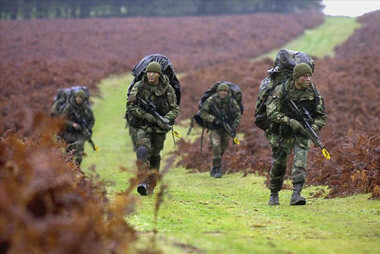 Like many other countries British army is always busy to test its professional performance. 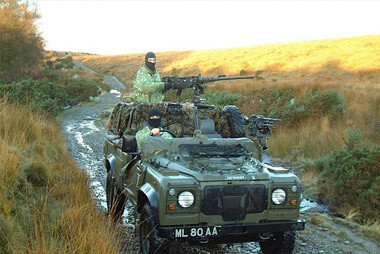 this year before start of winter season in order to test "Operational Capability” of their troops high command of UK arranged "Patrolling Exercise" on a international level, other armies were also invited so that by creating a friendly competition not only capabilities of British army could be tested but their standard could be shown to the world and besides also test other armies strategies. Accepting invitation for this competition including Pakistan, 16 countries participated. They included America, Canada, Germany, France, Italy, Australia, Belgium and Indian troops. As a whole 86 teams participated out of this 70 were from host country UK. These war games were continued from 8th October to 17th October and for patrolling exercises chose area near Wales which had fast streams, difficult mountain jungles, and as a man hurdle a river full of chilling water. 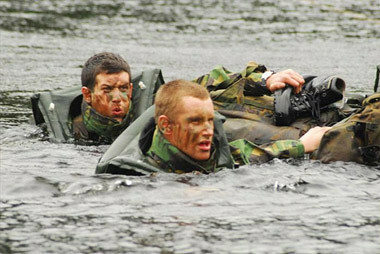 Patrolling troops had not only to cross that river without boats but also save their automatic weapons, ammunition and ration from being spoiled due to getting wet. due to this in spite one month has passed but international defense magazines are still busy in analyses and are taking war games named as "Cambrian Patrols Exercise" as most difficult war games. In this task weight of every soldier is inspected (is he carrying enough weight as per rules), i.e. all the needed goods during the operation automatic rifle, rounds, military boots, food etc. the goods of these soldiers can be checked during the operation and at the end of operation so that no one throws away his goods in order to move faster. The sub-segment of this task is "Initial Order Issue" i.e. has mission Commander fully briefed his men, every soldier is satisfied with orders of his commander and has anyone asked further questions? In this task Pakistani Team scored "Ex". Has the troops being dispatched on patrolling collected the necessary information so that quickly complete their tasks in the area of enemy. In the military terms this is known as "Tactical Movement". The score of Pakistan in this task was "Ex". This is the report prepared by going into the enemy area and presented to the commander before leaving for the mission. Pakistan scored here "Ex" as well. On this British soldiers were astonished that how in a strange area thousands of miles away from their country Pakistani soldiers conducted such a successful Recce and prepared such a detailed map showing the number and installations of enemy. In this even British soldiers were not able to gather such details. This was the only task in which Pakistani troops could not perform well. Because lack of latest tools Pakistani soldiers had to face hurdles in the search of mines. In spite of this Pakistani team scored "G". 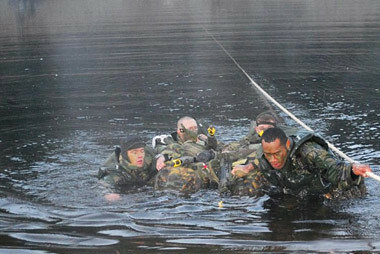 This was the competition to cross the river and other hurdles. In this task not only Pakistani soldiers crossed the river before the given time but also did not waste any of their goods due to cold and deep water. While more then half of teams lost big part of their goods into the river, some one lost helmet, one lost rifle or other lost his bag "Pithu". Pakistan scored "Ex" in this too. The soldiers of infantry who succeed in going to near the enemy ask support from the Artillery while specifying targets so that Artillery could destroy the enemy. Astonishingly no shell fired by Pakistani artillery was wasted; this was the magic of communication between soldiers who have infiltrated the enemy area and commander of artillery, the understanding of correct target and clarification of the correct target. Pakistani team scored "Ex". The attack on enemy through ambush; in this operation enemies attacked Pakistani troops from two sides, as a response not only Pakistanis strengthened their position but cleared away the area from enemy. This was the most difficult segment of the whole operation. Pakistani troops scored "Ex" utilizing their professional capabilities. The protection of ammunition during the operation; in this segment America, Canada, Germany scored "Poor", the same situation was with British troops, and there ammunition became unusable due to getting wet. Some lost their rifles in deep water while others when arrived to land their weapons were not ready to use at once. In contrast to this Pakistani soldiers protected their weapons with expertise and got "Ex" score. After completing mission soldiers have to give a detailed report about the mission to their commander. This was a test of soldier’s individual and collective observation and memory. The weight which they have been given at the time of departure has to be rechecked so that soldiers have not dropped their goods in order to move faster. Pakistan scored here “Ex” as well. Technically this was also very important and difficult part of the operation. 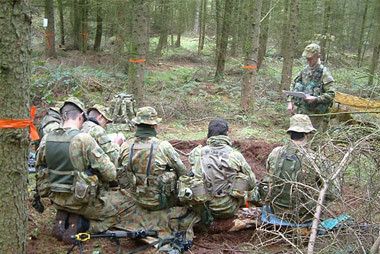 Here the troops on mission had to keep in contact with the commander, they had to report everything and complete mission under his advice and command. Here I would like to tell my readers that all the conversation is done through “Code Words” so that if enemy intercepts them it should not be able to know that what their targets are. Pakistani soldiers cleverly used such code words which were beyond knowledge of judges and scorers. Keep in mind that such Judges were present which had knowledge of all Pakistani languages. In this competition our soldiers also got “Ex”. In this way Pakistan defeated all of the teams in competition. Although the competition of Pakistani army was with best equipped and modernized armies of world. All of their soldiers were equipped with latest equipment (night vision, laser guided rifles, Computerized compass, and GPS etc.) which are away from access of Pakistani soldiers. But in spite of this our soldiers are equipped with courage, strong belief in Allah and professionalism and earned “Gold Medal”. “A very impressive team, they arrived and left each task at the run. Physically very fit. A well deserved award”. Now the need is that our President and Prime Minister should call the soldiers who participated in these competitions and award them with prizes. In this way definitely the morale of whole army will rise. Prime Minister has already said that this is their own army then he is away from them?